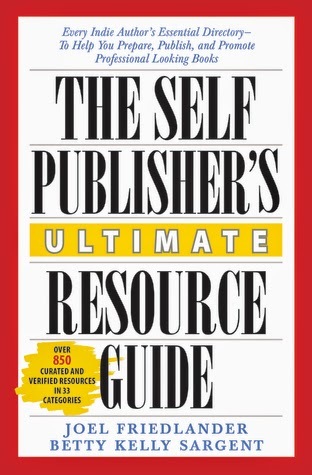 I had very high hopes for The Self-Publisher's Ultimate Resource Guide. I've been following Mr. Friedlander's blog for a long time and have received some great publishing advice there. Perhaps my expectations were too high, but this book was not what I was expecting. Be sure to read the blurb--that's what you get--a list of resources. First of all, it is a great resource guide. The book is a series of lists, containing links to sites offering services for self-published authors. I didn't check every link so I can't vouch for the verity of each individual link. However, I noticed that many links I have bookmarked on my PC were also in the book. I spent hours and hours weeding through the numerous sites out there. This book does it for you, as long as you're okay trusting someone else's research. So, in that it's a huge time-saver! If you are completely new to self-publishing, please note that this book does not go into anything in detail. I think this book is more for those who are experienced but in need of additional links and information. If you are looking for a book full of links to services for self-published authors, then this is a great book for you. But if you are looking for an in-depth guide to self-publishing, you'll have to find that elsewhere. I do like the fact that the authors intend to update the book, providing additional links as needed.